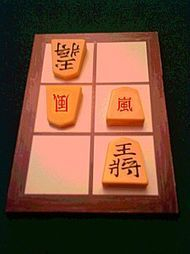 Gufuu Shogi is a shogi-like game played on a 2x3 game. 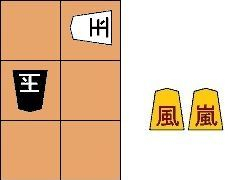 Despite its connections with Shogi, Gufuu Shogi is not Japanese in origin, and was instead designed by a Finnish Shogi master Georg Dunkel. Due to some ambiguity on the official site, we have reviewed the rules here with some plausible assumptions. 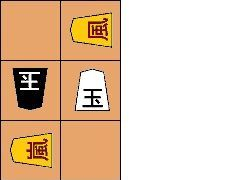 Gufuu ("hurricane") Shogi incorporates the usual Shogi rules of dropping and the objective of checkmating the enemy king, along with the unusual elements of shared pieces and rotating pieces. 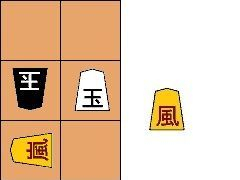 The new elements of Gufuushogi is to rotate pieces like whirlwind in four wind directions with each move, and even more dramatic, the shared ownership of pieces (other than the king). These complexities are needed to make up for the small size of the game. 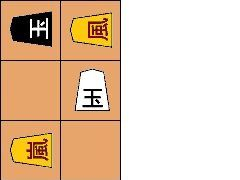 The game of Gufuu Shogi is played on a board of three row and two columns, with four pieces: Black's King (玉) , White's King, a Wind General (風), and a Storm General (嵐). The Wind and Storm Generals are shared pieces. When it is Black to move, they are Black's pieces, and upon Black's move, they change to White's pieces. Because they are shared pieces, they can also capture each other. The exception is that when either piece is delivering check (see next section), the piece belongs to the player giving check at that turn. This means the player in check must escape check. It is, however, allowed for the king to be moved into contact with the other general, provided it is not also delivering check (see *** below). The king is not allowed to capture either the wind or storm general when this piece is delivering check. It is similarly illegal to move or rotate the general delivering check (as it has temporarily been controlled by the player delivering check). It is, however, allowed for the other general to capture the checking general, provided that the other general is not simultanously delivering check. A double check by both generals simultanously can thus be answered only by moving one's king where it is not attacked by either piece. *** Although it is not explicitly stated on the official page, we surmise that it is legal to move or drop the wind or storm general in a way that threatens ones own king, or move the king so that it is attacked by a shared piece (provided the piece is not giving check initially and thus belonging to the opponent) and that the opponent may not immediately capture the king. This is supported by the example given by Dunkel and is consistent with the rest of the rules. 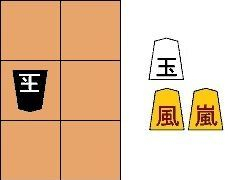 There are no long-range pieces in Gufuu Shogi. The king moves one step in any direction, as the king in chess or shogi. The wind general moves either one step directly forward or one step diagonally backward. The storm general moves one step to either side, directly forward, or diagonally forward. 1. The player can drop a piece from reserve onto the board. It can face any of four directions. Note that since pieces are shared, any piece not currently on the board may be dropped, regardless of the player who has captured it previously. It is illegal to give check when dropping a piece. *** Although not explicitly mentioned by Dunkel, it is assumed (though his examples) that dropping a piece in a manner that attacks your own king is permissible, and that the opponent may not immediately win by capturing the king in the immediate next turn. 2. The player may move a piece on the board to a vacant square (recall the rules of movement for the piece). Upon reaching the destination, the piece is rotated clockwise by 90 degrees. It is legal to move a piece in a way such that the king is in control of a general, provided that the opponent does not temporarily control the general. See the rules of shared pieces above. 3. 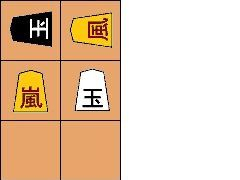 The player may move a piece on the board to a square occupied by the wind or storm general, capturing it. Upon reaching the destination, the capturing piece is rotated clockwise by 90 degrees. The captured piece can be reintroduced into play by either player later (see #1). Pieces held in reserve are shared and may be later dropped by either player. 4. The player may rotate his king or the wind or storm general clockwise by 90 degrees without moving it. 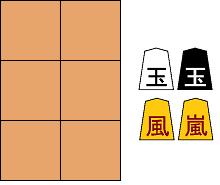 The opening of Gufuushogi lasts for four moves, in which only drop moves are utilized. The game opens with black dropping his King, followed by white dropping his King. 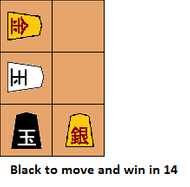 Black then drops the shared Wind general, followed by white dropping the shared Storm general. The above rules for dropping apply. Due to the small board, the Kings are allowed to come into contact with each other. The only limitation is that the King may not face each other. For example, the following positions are legal. On the other hand, the following positions are illegal. 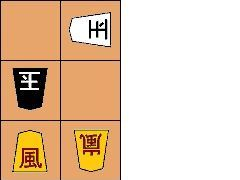 As in most chess and shogi variants, a player's king is in check if it is threatened with capture by the wind or storm general. However, an additional rule stipulates that a piece may deliver check only if it is adjacent (including diagonally) to the checking opponent's king. Note that because of the shared pieces, stalemate is impossible. Consider the following examples. In the positive above, it is white's turn to move. Even though the storm general controls the square of white's king, white is not in check as black's king is not adjacent to the storm general. White is free to leave the king in place, and the storm general may not capture the white king on the next move. In the position above, if it is white's turn to move, the storm general checks white's king, as the black king is adjacent to the general. By the rules, white may not move or rotate the storm general, as it is the general delivering check. The wind general is also not capable of capturing the storm general from its position. As there are no other safe spaces to move the white king, in particular, the storm general defends the wind general, this position is checkmate and black has won. We demonstrate the principles of these rules with the following example game. As always, black opens the game by dropping his king. White drops his king. Note that it would be illegal for white to drop his king on the lower-left-hand corner facing to the north, as the kings would be next to each other facing each other. Black drops the shared wind general. Even though the wind general now controls the space of the black king, this is legal as white is not delivering check with the wind general and thus does not control this piece at this move. White moves his king next to the wind general. At this point, the wind general delivers check to black's king, and white gains ownership of the general for this move. Consequently, black is not entitled to move or rotate the wind general, or capture it with his king, in the next move. Black is, however, allowed to capture the wind general with the storm general. See below. Note that even though this puts the black king in range of the storm general, this is OK as white was not previously delivering check with this general (and does not control this general). White drops the wind general. Recall that there is no ownership of pieces held in reserve. At this point, the storm general checks black's king. Black escapes check. 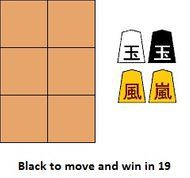 Note that black is allowed to move to a square controlled by the wind general as white does not currently control this general. White moves the storm general to check black's king. Now black's king is checked by both generals, and he is not allowed to move, rotate, or capture either general. Black has been checkmated and white has won. We strongly* solved Gufuu Shogi by retrograde analysis**. First, all of the reachable Gufuu Shogi positions are generated via depth-first search with memoization. There are a total of 203,195 reachable positions, including ones in which the pieces are being developed, and counting positions in which both sides are to move. This figure, 203,195, is also known as the game's state-space complexity. By comparison, tic-tac-toe has a state-space complexity of 5,478. All of these positions are then stored in a hash table. Working backward from all checkmating positions (there are 23,020 positions where one side has been checkmated), we compute the theoretical value of each position under perfect play. This tell us which side, if either, may force a win and the length of the shortest winning strategy. There are 54,254 positions in which perfect play on both parties theoretically yields a draw, meaning that there is no sequence of moves that may force a win for either player, and the best strategy on the part of both players will result in perpetual repetition, a draw. * A strong solution to a game shows how one should perfectly play each reachable position of the game, whereas a weak solution shows either the winning strategy for one of the players from the starting position, or the drawing strategy for both sides, enabling perfect play from the starting position. ** Retrograde analysis is also used to generate endgame tablebases for more complex games such as chess, in which few pieces remain, and thus the set of positions of interest can be enumerated. In essence, Gufuu Shogi can be considered a game played entirely in the endgame. We found that starting from the opening position, black may force a win in 19 moves of each side (37 plies). The unique best first move for black is to drop the black king, facing south, in the center of the left column (or symmetrically, facing north in the center of the right column). In the above position, black may force a win in 28 moves on each side (55 plies). This is the longest forced win that can be reached in this game. It should be noted that this position does not occur in optimum play and can only result from one or more mistakes from either side earlier in the game. Nonetheless, it shows the relatively complexity of this seemingly small game. By contrast, in chess, a knight and a bishop, a guaranteed win, albiet considered a difficult one, require no more than 34 moves on each side (67 plies) to checkmate a lone king in the worst case. Interestingly, the longest forced mate sequence in 3x3 chess is 31 plies. Interestingly, a total of 45,232 positions of Gufuu Shogi, or 22.3% of all reachable positions, allow the side to move the opportunity to checkmate his opponent in the next move. 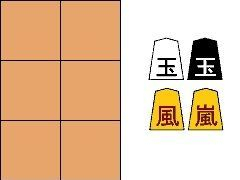 In essence, most of the positions of Gufuu Shogi are simple (forced mate within a small number of moves), with a relatively small fraction of very long forced wins contributing to the complexity of Gufuu Shogi. The following text-based program plays Gufuu Shogi perfectly, winning as quickly as possible or delaying losses as long as possible. If multiple best moves exist, one is chosen at random. We encourage playing two-player mode to familarize yourself with the rules of the game, as they are significantly confusing relative to that of chess or shogi. The added complexity is needed to make an interesting chess-like variant on a small board. Follow the text prompts to enter your move. Each move involves a piece (K, W, S), a direction if the move involves a drop (N, E, S, W), and a destination (may be the original square itself if the move is a rotation-only move). You may enter "Undo" to undo your last move (you may go back as many moves as you wish). At each position, the program computes the best outcome assuming perfect play, meaning each opponent aims to win as quickly as possible or delay losing as long as possible. 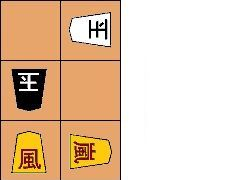 Note: the gufuushogi.exe executable reads gufuu.dat, the solution table. You must extract both files to the same folder. These results suggest some variations of Gufuu Shogi of interest. Possibly the direction of the moves of the pieces could be modified to maximize the complexity of the game, as measured by the length of the shortest winning strategy. This would, in theory at least, make the game more challenging to strategize. Other interesting metrics include the proportion of drawn positions and proportion of positions in which a short winning strategy, consisting of relatively small number of moves, is available. Both metrics should be minimized in the interest of maximizing strategic complexity. An interesting exercise would be to increase the size of the board, possibly adding additional pieces, and evaluating the complexity of the extension by these metrics. 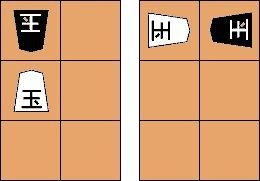 Can small chess variants like Gufuu Shogi still be interesting to play? Under perfect play, black has a winning strategy in 19 moves (37 plies). There is only one first move (excluding symmetry)for black to guarantee him a 19-move win (there are other winning moves, but White may delay the win). Can you find it? (Scroll down for solution). 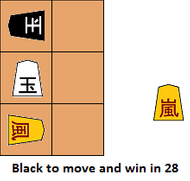 Gufuu Shogi's theoretically toughest game position, requiring up to 28 moves (55 plies) to win. By comparison, a knight and a bishop in chess, a difficult play on a much larger board, can always force a checkmate in no more than 34 moves. Can you find the winning strategy for black in the diagram? 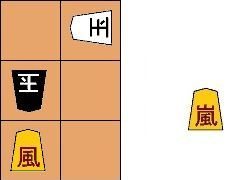 Gufuu Shogi can also be played with more conventional Shogi pieces. The gold and silver generals are good choices. 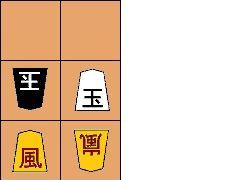 The pieces move as they do in traditional Shogi, but also rotate in accordance to the rules of Gufuu Shogi and are likewise shared pieces. Can you find the solution to the above problem? 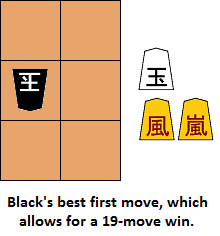 Black's best opening move, allowing for a win in 19 moves. Due to symmetry, black may also drop his king facing to the north on the center of the east edge of the board, for the same result.